We expect our electricity (for heat, air conditioning, and lights), water, and other utilities to be available whenever we want them. But our everyday essentials have become the target of our adversaries. Exacerbating the situation, when a part of the grid fails, we don’t know whether it is from natural causes or the actions of bad actors. Regardless, the failure needs to be fixed. Despite our diligence in the creation of new electric grid standards, these standards are not sufficient to address the urgent cyber threats and challenges that critical infrastructures now face. An assortment of smart grid standards, such as the International Electrotechnical Commission (IEC) and the Institute of Electrical and Electronics Engineers (IEEE), allow a viable approach vector to insert disinformation into the grid via a myriad of threat vectors. Innovative analytic approaches are required for the detection of one type of threat, known as misinformation or disinformation or astroturfing. This paper proposes a strategy that combines contextual analytics for version verification (current component state, component history, graphical knowledge of grid connectedness, a decay function for impact of other components), predictive modeling, and a computing model assessment using edge computing. 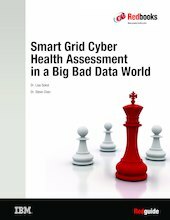 This IBM® Redguide™ publication describes the various issues that can impact the energy grid and provides examples of grid failures. It discusses the value and possibilities of a smart grid and how analytics can play a key role in the overall solution. It also introduces the combination of Irwin technology from Mehta Tech, Inc. and the IBM Watson™ cognitive system, which form a technology stack to monitor the electric grid.